Last fall Rio's favelas made global news thanks to Google and Microsoft projects to map the informal communities. These companies, like many others, see the favelas as budding consumer markets, but the fact that the neighborhoods are either absent or incomplete on most public maps makes it difficult to gather information about residents and existing businesses. The absence of information becomes even more serious in the context of governance and the delivery of key public services. 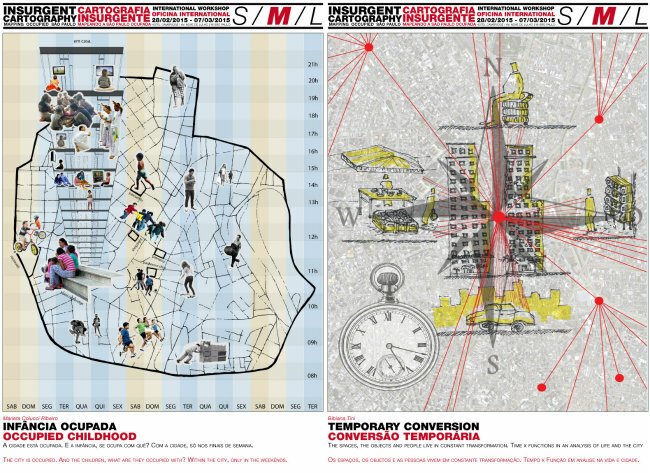 There is currently a growing movement to map the informal components of Global South cities, from decades-old settlements to recent homeless occupations. In this article we examine examples from Caracas, Tehran, Bogotá, and São Paulo. In Caracas there is only vague information about the size of the population living in barrios. 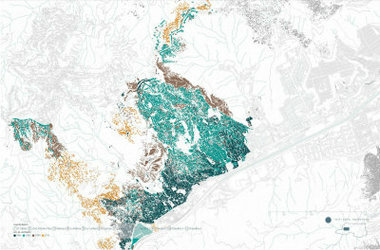 In 2013, Enlace Arquitectura started an ambitious project to map the growth of the city's informal communities, comparing maps from 1966, 1983, 2000, and 2014, in order to project current and future population levels. The study showed that most informal settlements began in the 1960's and saw major growth through 1984. After that point, most new informal occupations happened outside the metropolitan region. Many of the settlements inside the formal city have maintained stable populations since 1999. One of the most valuable results of mapping informal settlements is highlighting that many self-built houses in the settlements are just as old as the city's first skyscrapers. The mapping of informal settlement history provides proof that the 'informal' part of the city is not as temporary as some people think. Iranian cities have been implementing informal settlement upgrading plans since 1999. To develop these plans, the first step was to identify the scope of the project by defining the geographical boundaries of each informal settlement. The government's Urban Development and Revitalization Organization and an advisory board of urban planners have developed certain criteria to distinguish informal settlements from other parts of a city, including: lack of formal land titles; below-average household income; lack of sanitary facilities; illegal infrastructures for electricity and water; prevalent informal employment; high population density; and high crime and drug abuse rates. A wide range of techniques are used to map the basic information, including personal interviews and surveys. The upgrading plans have been criticized, however, due to low-budget and low-quality research and the unfortunate reality that even successful mapping may only result in low-cost and minor projects to actually improve living conditions. A series of recent judicial and administrative rulings in Bogotá have allowed for the legalization of several informal settlements located in a formerly protected natural area in the Cerros Orientales. Following legalization, these communities are priority recipients for neighborhood improvement programs. They face challenges such as a lack of infrastructure and facilities, safety issues due to poor construction, and even a lack of green spaces. Geographic Information Systems (GIS) is critical for the design of the neighborhood improvement programs. Tasks such as finding the ideal location for new urban facilities, or deciding where new green spaces should be built, become far simpler with the use of up-to-date GIS. Information about unstable or unsuitable terrain helps planners know where to avoid new projects, and what areas need projects to enhance safety. Of course, quality mapping and design alone cannot guarantee a successful project; implementation demands sufficient budget capacity and the political will of municipal officials. At least four thousand families live in occupied buildings in São Paulo's center, yet the homeless housing movement remains invisible to many citizens. 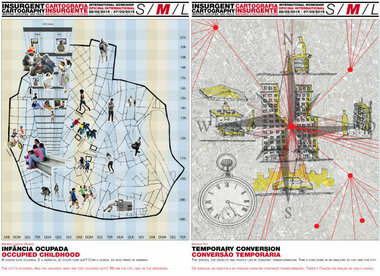 A team of Belgian urbanists hosted a workshop on mapping occupied São Paulo in March 2015, focused on learning how the movements that occupy empty buildings manage to improve living conditions and the lives of inhabitants without the help of professional architects or planners. The first inhabitants who broke into the building remember the infestations, garbage, and leakage problems, and how they organized themselves in working groups in order to renovate the building. The aim of the workshop was to use mapping as a tool to visually uncover and graphically translate the reality of occupation. Workshop participants each mapped some aspect of life in the occupied buildings at building, neighborhood, and city levels, demystifying the occupations and opening new doors for collaboration. Check out more of the discussion on visualizing urban poverty to reshape community on URB.im and contribute your thoughts.